Technically there are parking spaces between my curb and the street, but I’m happy to say that doesn’t stop the plows, unless there’s something actually parked in them. Still, the state Department of Transportation trucks save those areas for last, and last weekend was no exception. The other day the Town of Albion got to the spaces first: I was sitting on the couch, doing that writing thing I do, when I heard heavy machinery slowly moving down the road. I drew back the curtain and saw a plus-size snow blower and a dump truck going slowly along the curb, picking up most of that snow in the parking areas. Snow plow drivers are one of those professions targeted by the arm chair quarterback. It starts with “they plowed in my driveway”, and goes right on through everything else they do. And yes, they do plow in my driveway. They also once broke off a utility cap at the entrance to my driveway, which caused me to have two flat tires before I figured out what was going on. Oh, and they also allow me to get to work and the grocery store, reach the fire station for calls, take my kids to school, and just generally get out of the house. Not that I want to get out of the house during winter, but still. As is typical of such jobs, armchair quarterbacks have rarely actually done them. Visibility for drivers plowing snow is horrible even in their first hour at work, let alone their twelfth. They have to make multiple runs back to their base as their salt and sand run out. They have to put up with impatient drivers crowding them, and those trucks don’t stop on a frozen dime. They have to work their way around cars abandoned in drifts, and often the car owners can’t be found because they didn’t bother to tell the police they got stuck. They go out, by definition, in the very worst weather. 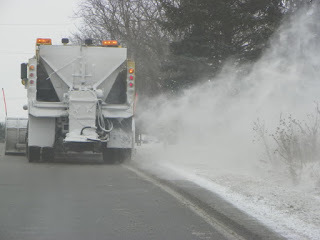 But here’s the specific thing that struck me that Sunday, as I watched the Town of Albion Street Department guys go by, and a short time after that an INDOT snow plow that still managed to deposit a layer of hardened slush on my sidewalk. It struck me that they were working … and it was a Sunday. I work in the emergency services, but as a 911 dispatcher it’s shift work. It’s very rare that things are so bad I have to stay over. If a snowstorm happens to hit during my days off, I almost never get called in. If the snowstorm is an hour out, and it’s 7 a.m.–I go home. I don’t have to brave the elements again until my next shift, unless my volunteer fire department gets called out. But almost all snow plow drivers are on call 24 hours a day, 7 days a week. For most government entities and private snow removal companies, there aren’t enough plows or people for the drivers to work eight hour shifts. When a storm hits, they don’t get to watch it through the picture window just because it’s a holiday, or a weekend. A snow plow driver works every storm, every time. Okay, so they cover your sidewalk and block your driveway. Would you rather they lifted their blades as they go by, and leave the street covered? You would? Then you’re an idiot. 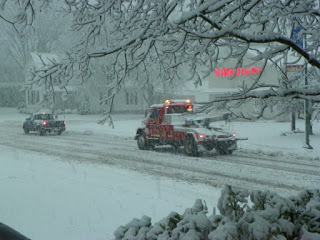 I use this photo a lot, because it’s the only one I have of a plow in action. Why? Because I don’t go out in that crap if I can avoid it. Why? Because I’m not an idiot. Having, in the past, sometimes indulged in snow shoveling, I can honestly say that being snowed in and having to stay home is not the worst fate. I agree … but that’s just not an option for someone who works in the emergency services. If only it was! I used to have an electric snow blower. Once I crossed the street to do a widow’s driveway, adding two extension cords. Snow plow happened to come by shortly after I crossed the street, sending my entire ingenious invention flying. Now I leave that stuff to the pros. Wow … I was just looking at electric snow blowers for sale. Granted that I wouldn’t lay a line across the street, being that it’s a state highway, but I could see myself running over my own electric cord.